Albuquerque Convention Center in Albuquerque, N.M.
Resurrection Fighting Alliance’s reputation as a top developmental league stands up to the test once again with its 18th offering, which also marks its first stop in Albuquerque. The promotion shines the spotlight once more on top flyweight prospect Matt Manzanares, who lost his first title bid to Zach Makovsky but returned to capture gold with a win over Junior Maranhao. Now, Manzanares is set to make his first title defense against Alexandre Pantoja. 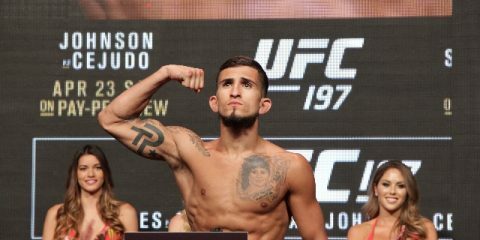 The RFA’s true test came in finding such a quality challenger on just four weeks’ notice after original contender Joby Sanchez was snatched up by the UFC. Manzanares has been through a gauntlet since joining the RFA. He fell to Aaron Ely in his promotional debut, but rebounded with a pair of stoppage wins to earn a spot opposite Makovsky in a championship tilt. Makovsky won the belt and went on to join the UFC, opening the door for Manzanares to compete for the gold once more. The Black Dragon Martial Arts product seized the opportunity and eked out a split decision victory over Maranhao. The 28-year-old made his pro debut in 2011 and picked up all his wins via stoppage prior to the decision in his most recent victory. He has scored four wins via strikes and two by way of submission. Manzanares has a purple belt in Brazilian Jiu-Jitsu and is a two-time Junior Olympian in boxing. His amateur career featured a stretch in 2010 where he went 2-4, including three first-round stoppage losses, but he has developed into a top flyweight and his ability to go a full five rounds with Makovsky and Maranhao proves that he’s a tough challenge for any opponent. Pantoja, a Brazilian fighting out of the famed Nova Uniao camp, steps in to replace an equally well-rounded Jackson’s MMA fighter. The 24-year-old has never been stopped, and one of his decision losses came via a split verdict. Pantoja, who debuted in 2007 shortly after he turned 17, won seven of his first eight fights. His second loss came against current UFC flyweight contender Jussier “Formiga” da Silva. He has bounced back with seven straight wins, including two unanimous decision victories over Lincoln de Sa. The 16-fight veteran has six wins by some form of knockout and four via submission. Pantoja combines a strong Muay Thai skill set with an excellent ground game, but his gas tank has been called into question in the past. This fight pits an accomplished boxer against a Muay Thai practitioner in a battle of two of the more knockout-heavy fighters at 125 pounds. Pantoja has an excellent sprawl, but he probably won’t need it in this encounter, which has all the makings of a stand-up war. Manzanares has the better hand, head and foot movement, and he needs to avoid getting into a brawl with Pantoja, who tends to rely heavily on a wild approach. Manzanares also fights longer than Pantoja, so he could keep the Nova Uniao fighter at range and look to outpoint him. In a brawl, Pantoja could land some significant strikes against Manzanares, but if the two-time Junior Olympian boxer can stay technical, then he has the ability to pick apart his Brazilian foe and possibly score a knockout on a counter. First, Manzanares suffered a loss to an opponent who immediately headed to the Octagon. Then, after picking up the title in his last outing, he watched his first scheduled challenger walk away to accept a UFC contract. Now, Manzanares has to be viewing this as his turn to catch UFC matchmaker Sean Shelby’s eye. This is a big test for the Wyoming-based fighter, but it’s one he can pass. Pantoja has a tendency to set up and throw one punch, but then lunge in with any follow-up strikes. Manzanares is excellent at countering this type of attack (look up his finish of Kevin Gray from RFA 5), and his tighter striking style should provide him with plenty of opportunities to drop Pantoja as the Brazilian marches forward. Despite two decisions in a row for Manzanares and a decision in Pantoja’s last outing, it’s difficult to see this fight going a full 25 minutes. It’s more likely that someone ends up staring at the lights before it’s through. Pantoja’s striking-based attack has some holes, and if there’s ever a test for one’s cardio, it’s taking a fight in the high elevation of Albuquerque. Pantoja will slow down and get sloppy as the fight progresses, and that’s when Manzanares will strike to score the knockout finish. Live stream available online at Facebook/Lonsdale (prelims) and Facebook/BAMMAUK (main card). In 2010, Paul Daley was a UFC contender. Then, in frustration at his first UFC loss, the British fighter threw a punch at Josh Koscheck after the bell that effectively ended his UFC tenure. Since Daley’s mistake cost him his UFC contract, he’s made numerous stops, including several that have taken him back to his roots as a top competitor in the major British regional promotions. BAMMA and Cage Warriors have both employed the controversial striker since his 2010 departure from the UFC, and BAMMA is bringing the welterweight back for a third appearance with the promotion. 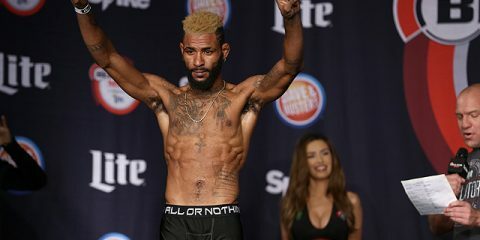 Daley, who also inked a deal with Bellator in July, will headline the 16th offering from BAMMA in a welterweight showdown with Brazilian striker Marinho Moreira da Rocha. Daley has a background in karate and Muay Thai. He’s seen great success as a kickboxer, where he scored a TKO victory over Artem Mironcev in mid-August. In his MMA career, the 31-year-old has an impressive 25 wins by some form of knockout. With 49 pro MMA fights and 22 kickboxing bouts, Daley has a ton of experience despite his relatively young age. After his 2-1 run in the UFC, the Brit scored four wins in a row before suffering back-to-back losses to Nick Diaz and Tyron Woodley. He’s gone 7-2 since the loss to Woodley, with his only losses coming on the scorecards against Kazuo Misaki and Alexander Yakovlev. Daley holds a purple belt in Brazilian Jiu-Jitsu, but the ground game is his biggest weakness. He has suffered five submission losses and has struggled to overcome wrestlers who have been able to take him to the mat. Daley will be happy to see a likeminded individual standing across from him in the BAMMA cage. After initially being booked against Igor Fernandes, a fighter with 14 submission finishes among his 18 career victories, Daley is now set to meet a fellow 31-year-old fighter who has picked up 21 of his 28 wins by some form of knockout. Fighting out of the Coalizao Fight Team, da Rocha has only seen the scorecards on five occasions since his 2004 pro debut. He is on a six-fight winning streak and is 13-2 since the beginning of 2010. BAMMA matchmaker Jude Samuel has to be praised for putting together a highly competitive bout on just two weeks’ notice. With a featherweight title tilt and a British welterweight title fight rounding out the featured bouts on this card, Daley’s return can be featured as an entertaining striking affair. 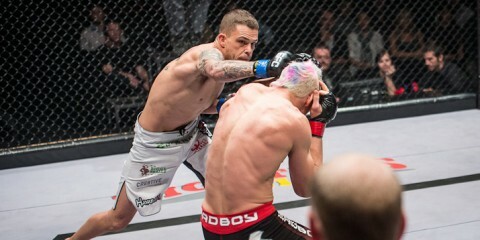 His original opponent, the aforementioned Fernandes, would have posed more problems for Daley on the mat, but da Rocha allows the British star to go toe-to-toe with another knockout artist. Da Rocha has a bad habit of coming up short against the best competition he has faced. It happened against Iuri Alcantara in 2009, and against Gil de Freitas and Viscardi Andrade in 2011. In his current winning streak, consisting entirely of TKO and knockout victories, he’s met opponents with a current combined record of 27-36 with only two opponents sitting at or above the .500 mark. Daley brings a highly aggressive stand-up attack, whereas da Rocha seems more plodding in his approach. That’s not to say the Brazilian won’t be a threat to lay out Daley, but Daley should hold a speed and precision advantage in this contest. Daley’s gearing up for a run in Bellator MMA and this will mark his last fight under contract with BAMMA. It’s a proper send-off, with the Brit taking on a fellow striker in a bout the former UFC contender should be able to win. This will be an entertaining fight with plenty of big exchanges on the feet, but Daley will reign as the better man. He’ll score a knockout by the midway point of the bout. While BAMMA invades Manchester on Saturday, fellow British promotion Cage Warriors heads to Wales for its 72nd show. The card features a tussle for the vacant bantamweight strap, but the real highlight is the evening’s headliner, a welterweight championship bout. Reigning 170-pound kingpin Nicolas Dalby puts his belt on the line against veteran Gael Grimaud. 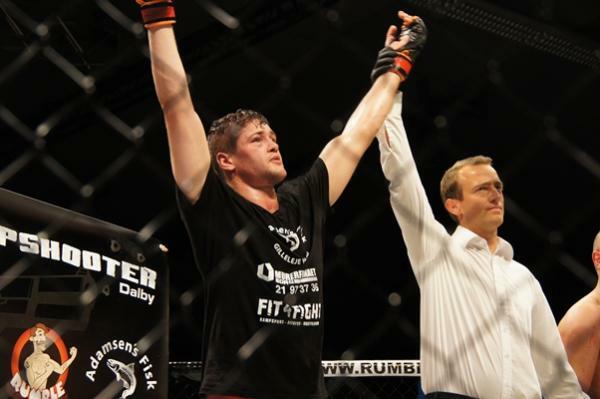 With the UFC’s global expansion and its raiding of the Cage Warriors roster for stars such as Conor McGregor and Cathal Pendred, it’s somewhat surprising to see Dalby still plugging away under the Cage Warriors banner. The 29-year-old Danish fighter has amassed an unblemished record through 12 fights since his pro debut in 2010. Among the highlights of his career are a six-second knockout victory in his third pro bout, a pair of decision victories over Ivica Truscek and a fourth-round stoppage of Sergei Churilov to claim Cage Warriors gold in his debut with the promotion. He has a well-rounded skill set which has allowed him to capture four wins by some form of knockout and three by way of submission. 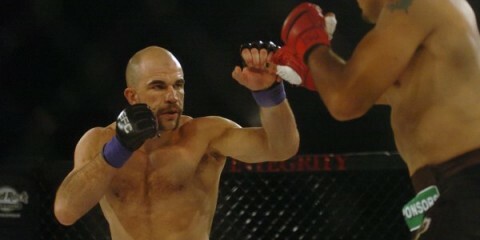 Grimaud is a longtime journeyman who has seen stints with M-1 Challenge and Cage Warriors. The 34-year-old Frenchman started his pro career in 2008 and reeled off four wins before stumbling in three of his next four contests. His losses in that span came against the likes of Yuya Shirai, Abner Lloveras and Gor Harutunian, which demonstrates his willingness to step up against tough competition. After his 5-3 start, Grimaud settled in to go 14-3 over his next 17 fights. Each of his three losses in that stretch made it to the scorecards, but he avenged the first of those losses when he notched a unanimous verdict of his own against Seydina Seck. 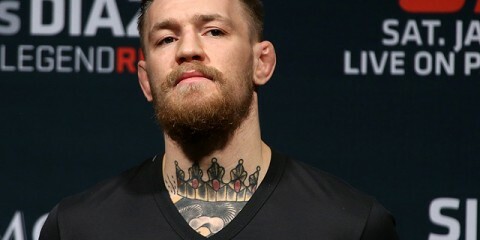 His most recent defeat came against recent TUF contestant Cathal Pendred. Meanwhile, Grimaud was able to score an upset with a submission win over TUF alum Jesse Taylor. 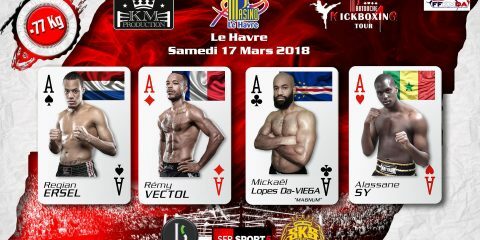 The Haute Tension and Team Toulouse product has picked up first-round stoppages, including a 45-second knockout of Bruno Carvalho, in his two most recent fights. Grimaud is a decorated Brazilian Jiu-Jitsu practitioner who has picked up 12 of his MMA victories by way of submission. Grimaud’s record can be deceiving. Despite having suffered six losses, he’s a highly competitive fighter who could play spoiler to Dalby’s ongoing undefeated campaign. The French fighter has the ability to get fights to the ground and finish opponents, but he’s also displayed a lot of power in his hands. Dalby isn’t likely to get caught by one of Grimaud’s punches, but he could find himself in a battle that’s heavy on clinches and takedowns. Grimaud has only been stopped once, via TKO early in his career. Dalby, of course, has never lost, but he has gone the distance in five fights. He’ll seek to gain the upper hand on the feet, but he might be hesitant to mix in many kicks for fear of getting taken down. This should be a grinding fight that sees both men have their moments. In the end, Grimaud’s ability to survive will carry this fight to the judges. It’s not difficult to see Grimaud scoring an upset, but Dalby should be able to outpoint the older fighter on the feet to take the nod.